It’s not complicated. It’s football. Sports reporters, sports broadcasters, and the sports media, in general, are up in arms. They don’t understand how you, the common NFL fan, can avoid caring about all these stories they’ve created to open your eyes to the true nature of the NFL. After all of the hard work they’ve put in to characterize your favorite players, your favorite team, the commissioner of the league, and the institutional culture surrounding them, you keep watching with your eyes wide shut. You don’t care. It’s the strangest thing. This may be based on the fact that we don’t care about the NFL. We love the game, we love the games, and the teams and individuals who play those games, but we have disassociated them from the NFL, the league, and the daily soap opera that surrounds it. Perhaps that’s a small price that the NFL has paid for being so huge that some of us can do all of that and love the game, and not feel like we’re contradicting ourselves. 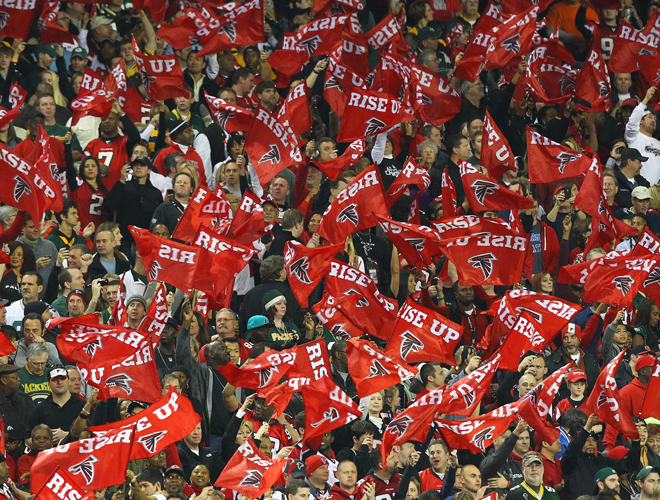 Atlanta Falcons fans wave “Rise Up” flags during an NFL Divisional Playoff game against the Green Bay Packers on January 15, 2011. Those who have watched, read, and listened to the sports media over the last couple of years have been inundated with NFL stories that will “officially, and unquestionably, begin the ending our enjoyment of the NFL.” When those stories come out, and we don’t abandon the game, the sports media moved onto that next story “that will tick the general public off so much that I don’t see how the NFL survives this without lasting damage to their product.” Even after the members of the media make that proclamation, and the next one, the numbers don’t decrease in the least. We stubborn, fans keep watching the game in record numbers. The NFL is still the king of all sports. It’s so far ahead of the other professional sports, still, that the competition might need a James Webb Space telescope just to read their corporate strategies, and this is in the wake of three-to-four years of almost nonstop, negative media coverage. What is going on, these sports reporters keep asking. The answer is that the NFL is big, and huge, but not so huge that it affects the daily lives of people watching the sport to the point that they care. To illustrate this, we need only look at the contrasting conditions that exist in the socially conscious world. In the socially conscious world, socially conscious consumers care. Socially conscious consumers now have websites, blogs, apps, and podcasts devoted to informing them of the latest socially conscious gossip. The socially conscious pay attention, they scour various information resources before making financial decisions, and they punish those who don’t fall in lock step. It’s become a huge business for those “who care” about what they care about, a business that much to the surprise of the socially conscious in the sports media, the common NFL fan takes no part in. In the socially conscious world, the media are king makers. They can make or break a corporation, or an individual, with a couple lines here and there. With the right story, or an accumulation of stories, the media can drive a corporation out of business. The corporation may try to adjust their practices to fit in with the prevailing winds of our culture, but in the socially conscious world once the damage is done, it’s done. When socially conscious stories encroach upon the stature of the NFL, it attempts to adjust to the prevailing winds of our culture accordingly, as any other corporation worried about the prospects of their product will. They sit players for infractions large and small, they fine them, and then they blast their socially conscious reactions out into the worldwide media for contrition. Few NFL fans care one way or another. Few of them care about the transgressions in the report. Few care about the contrition. And the confusing simplicity of this is, few care about the NFL. They just want to watch football. Most common, NFL fans are not socially conscious consumers, and I write that in the most complimentary manner possible. They are mostly male, between the ages of 35-54, making less than 100k a year. They are hard-working people who pay little attention to politics, world affairs, or social issues in general. Opponents may charge that they are head-in-the-sand ostriches, and that may be true in a larger sense, but in a more revealing scope, I think we can surmise that they don’t pick and choose the social issues to care about. They don’t care about any of them. They are one of our most consistent demographics in our country. They tend to their backyards, and they expect you to do the same, whether you are their neighbor or the NFL. They may think a little less of you when you don’t weed and water properly, but that doesn’t mean that the next time you lean over the fence, they’re going to avoid you. The common NFL fan may know a few of the players’ names. Some of them may know the high draft pick at left tackle, the weak side linebacker that can cover as well as he can tackle, and the 4.2, 40 star cornerback, and everyone knows the quarterback, but for the most part NFL games are won and lost by players whose names they will never know. They’re not as attached to these players as the media believes, in other words. Their kids might be, but they have created enough distance from the players that no one player can ruin the game with their off the field activities. The love of the game is not as in-depth for fans, as it is for reporters. For fans, it’s just football, and it really isn’t all that complicated. Those in the sports media make the mistake of assigning their own “age of enlightenment” social conscious worldview to their audience. They believe that socially conscious consumers are indicative of the evolved, new earthling, or at the very least that this idea of a socially conscious consumer has made its way to the NFL fan. They’re “wrong”, as Greg Cote says. “All of it.” We love the game of football. We appreciate watching talent at its highest level, but we don’t care about the NFL in a manner that if they don’t handle their controversies better, we’re going to abandon them. We’re not going to boo them when they take the field, depending on the charge, and we’re not going to applaud them when they come back … unless the collective they manage to violate one of our core tenets. We tune out when the NFL pregame shows start their broadcast with the latest “weight of the world” drama that has the whole NFL shook up. We don’t want to hear the perspective of this story from all four on-air personalities, and the sideline reporters’ latest quotes from the team’s equipment manager. We also don’t care about the human interest stories that follow these negative stories to inform us that not all NFL players are not as bad as inmate number 6843107347. We don’t care about the good, the bad, or the ugly. We want to watch a game of football, unless the collective they show display some sort of ingratitude for the fan that he or she can feel. For the devout fans’ desire to learn X’s and O’s analysis, injury reports, and the occasional trash talk, we now have to turn to the internet. We turn to the place that allows us just the facts, or if they don’t, we have the option of only clicking on stories that provide just the facts and figures we want to know more about. If I were a network programmer, I would experiment with a novel idea, a show called “Just Football!” It would be a jam-packed half hour (22 minutes with commercials) that contained two to three experts talking exclusively about the game. If a player was out, due to some drama, the anchor would say, “(That player) is out for the week!” He would say this with no more drama, and no more depth, than he would with a player that is injured for the week. “Just football!” another, more charismatic voice would say to outro. Word would get those two words out in the common NFL fan community, and the ratings would go through the roof. We watch the NFL to escape the social studies of our culture. We don’t care if “our guy” is a good guy or a bad guy. We just want to know if he has the talent, and the physical or mental prowess, to get across a line, or to stop the other guy from getting across a line. If he committed a transgression, he should be punished accordingly, but we don’t care about the story, the intricacies of the story, or the social pressure that needs to be exerted to get these people to change. We just want football. It’s not complicated. We’re not going to stop watching the game because someone did something bad, in other words, and we’re not going to start watching a game because a guy did something good. We’re not socially conscious viewers. If that were the case, we would’ve stopped watching this game long ago, because some of these players use excessive force when they hit one another. “Voraciously, sports reporters and broadcasters keep sounding the first notes of the death knell of professional football. Forebodingly, they warn of the sport’s eroding credibility. Ominously, they say that player wrongdoing and Commissioner Roger Goodell’s missteps and mismanagement have served to fracture the public trust. Greg Cote goes onto report, with an undercurrent of some surprise that NFL fans care about football. The fan of the game didn’t care about concussion gate. All of the former NFL players –that now have on air personality jobs– preened themselves of the guilt of playing a contact sport by saying that they wouldn’t allow their children to play this violent game. This is now called virtue-signaling, and the anchors saying this were big time stars in their day. Those saying these things were the faces of the game … Pffft! didn’t make a dent. We didn’t get mad at these former players, however, as we knew that their “look at me” editorials were simply attempts to establish their bona fides as a broadcaster that would help them transition away from being identified solely as a former-player. Those who lasted through the sermon, without flipping the channel, probably didn’t hold it against the former players. They likely didn’t care one way or another. Due to Goddell’s actions over the last couple of years, you would be hard-pressed to find too many common fans who haven’t heard of Roger Goddell, but you would also be just as hard-pressed to find many fans who care about him. I don’t pay attention to such things, but I’m guessing that if you polled NFL fans about the latest press release from the commissioner’s office, you would see figures like .04% see it as a positive for the league, .96% see it as a negative, 4% haven’t heard of it, and 95% don’t care. Socially conscious consumers care about CEOs. They scour the position papers of these CEOs, and they read the analysis provided by socially conscious writers they trust. They focus a great deal of their attention on the CEO’s gender, race, and flossing habits. Most NFL fans don’t even know Roger’s middle name (Stokoe), because they don’t care. He’s not on the field, he’s not designing a defense, or an offense. He’s not the fan’s friend, or the fan’s enemy. He’s the commissioner of the NFL, equivalent to that fire hydrant on the end of their block. We know it’s there, and we know what it does, but we probably haven’t spent more than one accumulative minute of our lives thinking about it. Some fans may have a love/hate relationship with Goddell, based on the players he and his commission decides to take off the field, but they’re not going to allow him to influence their enjoyment of the game. When the commissioner does step on the field to do a coin-flip, or whatever a commissioner does during the pregame, we might hear some cheers and some boos, but listen carefully to those boos. Those boos build, as the fans wake out of their pregame slumber. Every pregame ceremony involves three to four names, and 90% of the fans don’t hear the names being mentioned. They only look to the countdown clock that informs them when the game begins. When the booing begins, son turns to dad, dad turns to other fan, until heads around the stadium turn to the scoreboard to try and figure out why everyone’s booing. They join in, they laugh, and it’s fun. He’s an authority figure, and it’s fun to boo authority figures, but no fan of the game cares about him, unless he were to take part in violating the core tenets of the NFL’s core fan. My guess is if the more involved fans didn’t start the booing, the viewing audience at home would hear nothing as this lawyer/bureaucrat walks on the field. Greg Cote describes the bad seeds that have littered the headlines as “weeds in the garden, things to be uprooted”. I would go one step further. I would say that they’re checkers. Checkers, as opposed to chess, in that no individual pieces in the game of checkers are irreplaceable. The quarterback could be said to be irreplaceable for a game, or even for a year, but when that quarterback does go down, and his career is deemed over, the devout NFL fan’s focus shifts to the prospect of getting a great prospect in the next draft. That fan may visit that former player’s car dealership, or car wash, in the years that follow. He may even shake that man’s hand and thank him for providing the area’s fans so much joy over the years. For the most part, however, that fan will have already moved on to the next guy, and no member of the media, no commissioner, and “surprisingly” no player can taint that relationship they have with the game. Most of them know this. Most of the players, coaches, and fans know it’s not about them. The only ones confused by the conundrum of why the NFL remains so popular, regardless what they do, are those in the media, and they’re apparently up in arms about it. Most NFL stars have been stars for most of their lives, and they know a level of adoration most sports’ stars never will. These stars might assume that that love is unconditional, and for the most part it is, but as recent evidence suggests there are some principles that NFL fans consider such a staple that even their favorite star cannot violate it. The average adult fan now knows that NFL stars are never going to be grateful to them for being a fan. The NFL star might pay symbolic homage to the fan, but we know that they take us for granted. We’ve come to accept this as the nature of the beast. As witnesses now know, it is possible to fray the bonds that seal this relationship. This article contains a note that suggests that no player, or players, can damage the bond NFL fans have with the league, but we now know that is not true. The media can try to make a dent, and the NFL commissioner can attempt to resolve that issue, and most NFL fans won’t care either way, but if the player shows an unprecedented level of ingratitude, most fans will leave, and some may never come back. We’ve all witnessed those TV’s permanently turned into the “off” position, on Sunday afternoons for a couple years now, even at Thanksgiving, and I don’t know when, or if, they will ever be turned back on. Congratulations, NFL players, you’ve proven me wrong. There is a way to do what I thought couldn’t be done. The otherwise ambivalent and apathetic fan base is now awoke, and they care more than I thought they would about a social issue. “socially conscious world”= Sheeple and these sheep dominate social media and attack anyone who might slightly disagree. The only good part is they get bored with most of these “issues” and move on to the new thing. There is always a T-shirt at somewhere like Target for them to get all in an uproar about.